This map is a steel plate engraving, dating to 1841 by the Society for the Diffusion of Useful Knowledge, S.D.U.K. It represents the Constantinople (Stambool), today known as Istanbul and once known as Byzantium. 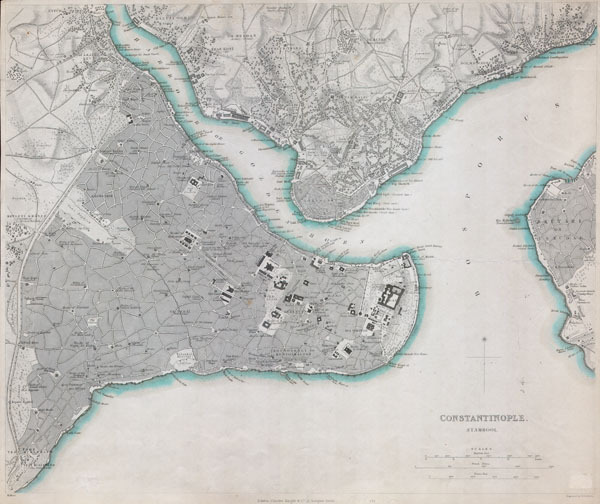 Beautifully exhibits the Golden Horn with neighbouring Ghalatah, and Constantinople's Asian part ‘Üskudar.' Depicts the city in considerable detail down to individual streets, markets, mosques, buildings and palaces. Published for the Society for the Diffusion of Useful Knowledge Atlas by Charles Knight of 22 Ludgate Street, London, 1841. Maps of the Society for the Diffusion of Useful Knowledge. Vol1. 1844. Very good condition. Margins narrow as issued. Branch, M.C. An atlas of rare city maps, p. 96-97. Rumsey 0890.169.